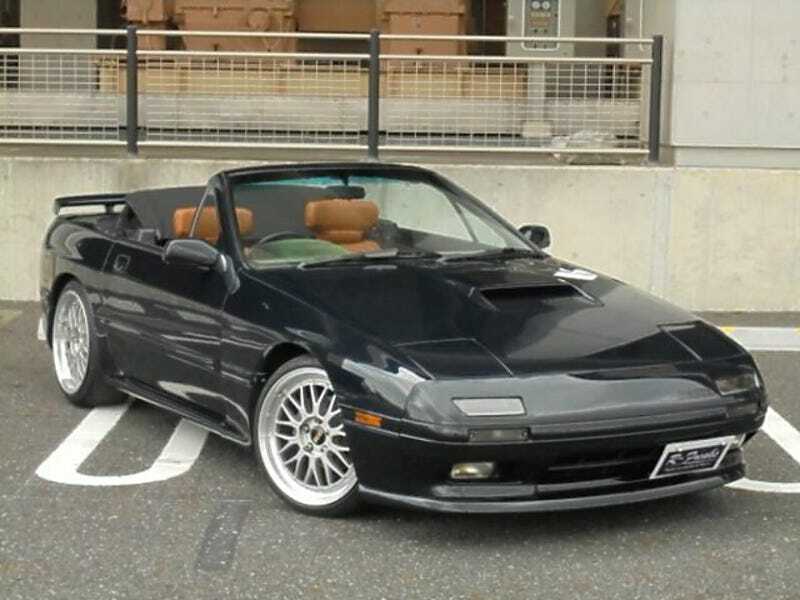 Lately I’ve been thinking that my ideal fun toy convertible is an FC RX-7 turbo convertible. Except the FC RX-7 convertible was only sold in the US in non-turbo form. I looked into turbo swaps, but then I realized all FCs sold in Japan were turbos. Onward, to goo-net-exchange! The FC RX-7 convertible has a very weird convertible top where you remove the center section like a targa, then lower the remaining convertible roof. In its stowed position, it sits kind of perched at an odd angle. The look is cleaned up when the tonneau cover is in place. This 1991 RX-7 cabriolet with an insanely low 35,400 km on the clock was the one and only FC convertible listed at the moment. It appears to be in lovely shape and has beautiful brown leather seats which may or may not have come from the factory. There are some aftermarket aero bits including an unfortunate looking rear spoiler, but otherwise seems to be a fine example, and far less of a project than converting a US-spec non-turbo FC into a turbo. The only problem with the one FC convertible on goo-net at the moment is its advertised price of ¥2,890,000 which at today’s exchange rate is a hair over $26k! But hey, now I have a new pastime: waiting for convertible FCs to show up on goo-net-exchange. Anyone know how to set up search alerts there? Actually no, don’t tell me, that will be bad for my marriage.